Thank you ALL for making this an awesome Goat Yoga season. We have a few dates left! Children are welcome! Please pre-register as classes fill up fast! Have you always wanted to do mountain pose next to a goat? 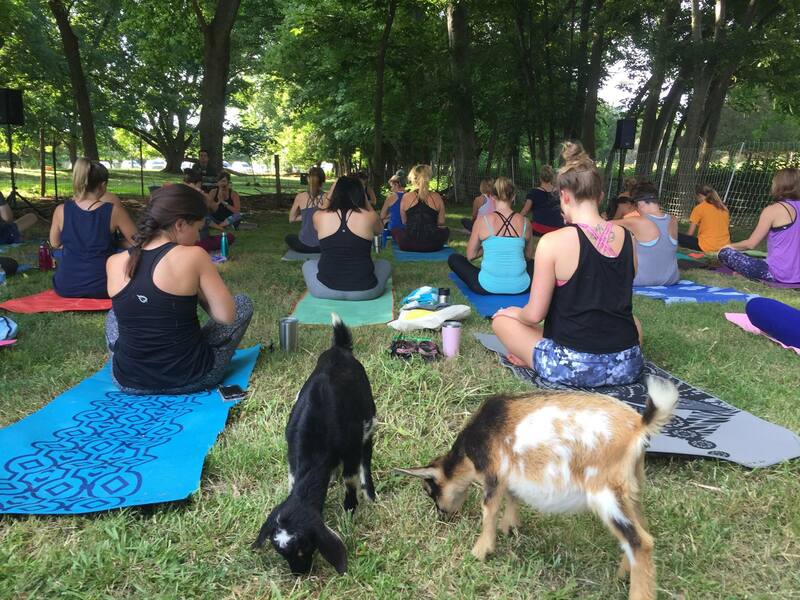 Join our social goats in the pasture and bring new meaning to your practice… they love our yoga days as much as we do. There is nothing better than goat noses interrupting yoga poses or the excited squeal of delight from Miss Sadie the sow who lives for farm visitors and belly rubs. All farm yoga is laid back and family friendly. Get in some good stretches, take in the fresh air, and snuggle our adorable baby goats! Get inspired by these 5 goat yoga poses. As a courtesy to our yogis, we request that you pre-register. Classes fill fast, save your spot! Children over 12 must pre-register. Children under 12 are welcome with a suggested donation of $5. •Please bring your own yoga mat and water. •Farm bug spray is available. •Weather permitting – We do not offer refunds for inclement weather. We will offer a rain date if applicable. •Please no spectators. If you attend, plan to pay and participate. Please carpool as parking is limited. We DO NOT have RESTROOMS available. Please plan accordingly. *If there is room, same day registration is $12 at the door. *We do not offer refunds for cancellation. In the case of emergency, we may allow a transfer of registration to another class date with 72 hour notice, and is at our discretion. My version of slow flow is breath-centered, like all my classes. I draw inspiration from a variety of sources and the focus is to link movement to breath, to find steadiness & space through the breath, to create stability & strength through supple joints & architecture that honors your unique body. I offer a variety of modifications for all bodies, from attention to safety for the spine to challenges for students who are looking to explore more complex poses. Teens age 14 and up welcome. Ready for a fun, lighthearted yoga experience like no other? Then join us for this mixed level Flow Yoga class for the whole family on the farm with the Goats. Our yoga class will focus on basic poses that build strength, balance, flexibility, and inspiration for the mind. Movements are done in sync with the breath. Expect leg, hip, back, shoulder openings followed by longer held stretches, perhaps we may even include a partner pose or two. A moving mediation in the beautiful outdoors on the fields of the farm. Expect to be greeted on the mat by a friendly Goat! Modifications are offered to allow for all skill levels. All ages welcome. Bring your own mat or beach towel, water, bug spray, and sun screen if needed. No pets allowed. Slow Flow is a Vinyasa based class, with a focus on linking breath with movement. Postures are generally held for longer periods, and students will transition between poses a little slower. The gentle nature of this class is great for beginners, but is also wonderful for intermediate and advanced students who feel like slowing it down and sinking deeper into their practice. Ages 8 and up welcome. This class begins with gentle warm-ups for joints and spine, followed by longer held poses from Yin Yoga, held for 3-5 minutes, and restorative poses, held for up to 10 minutes, to create a deep release and relaxation. All ages welcome. A day with dad on the farm, baby goats, yoga and beer brewing demo. Samples of Doc Hamilton’s home brew are available until tapped out. Brendan will be teaching a basic but challenging sequence accessible to all participants. He encourages you to wear comfortable clothes and bring a mat if you have one. Looking forward to seeing you there! All ages welcome.